5 Star Guttering is a locally owned & operated company based out of West Pasco, WA. Do you have insurance and the proper licenses? Yes we are fully insured & bonded. We do commercial and residential installations. What types of gutter styles are available? 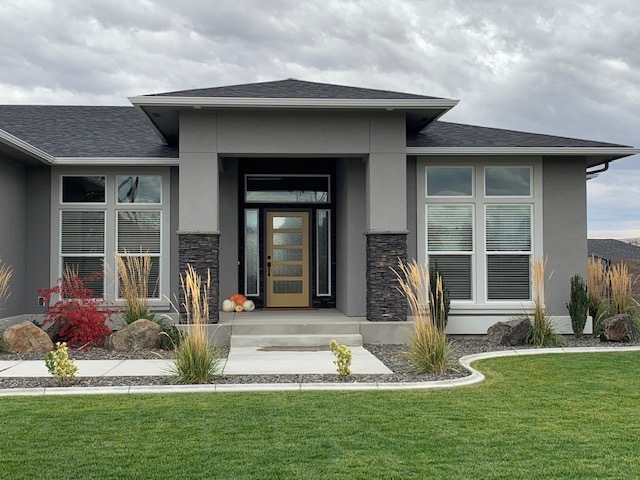 We offer our K-Style gutter system (standard), five inch gutter system, and our contemporary gutter system which is a six inch gutter system perfect for custom homes and commercial properties. We also offer half round gutters. Do you offer seamless gutters? Seamless gutter systems are the only type that we install. What type of seams does your company use on corners? We use strip miters on every single one of our gutter systems. A strip miter is a narrow piece of aluminum with a 90 degree bend that fit over the gutter seam and screws into both gutters. Can you install gutters that match the color of my home? Yes! We have over 50 color options available for clients to choose from. We use heavy duty hangers placed every two feet of gutter and fasten with four inch screws. 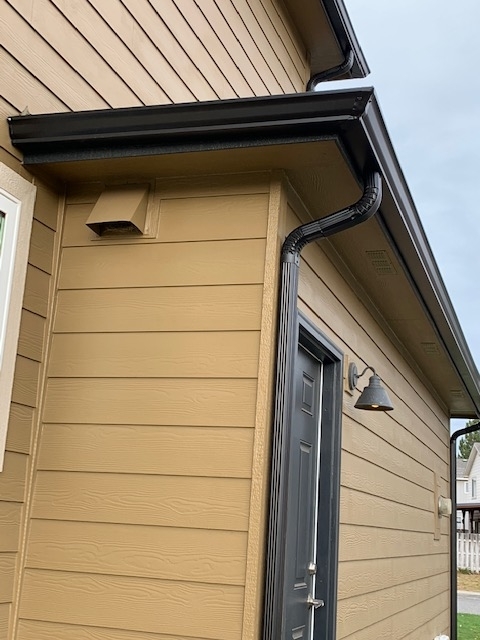 With the high winds in the Tri-Cities area, we want to make sure that every gutter installation performed by 5 Star Guttering is a quality install with the right amount of hangers and screws that will maintain the system in place for many years to come. Can you install gutter guards? Yes! We do install leaf guards only. Leaf guards are intended to keep leafs away from downspouts and out of the gutter system. Leafs can easily clog the gutter system keeping it from working properly. Leaf guards are not intended to replace regular maintenance. One must still do maintenance on the gutter system even with leaf guards once per year to extend the life span of the system. No. There are many factors that go into play when providing you with an accurate estimate. We want to make sure that we always give you an accurate estimate and the best way to do that is by scheduling an estimate. Do you include a warranty on your work? We offer a one year warranty with every installation. If any problems should arise with our installation, we will come out and fix it at no-additional cost to you. Warranty does not include homeowner damages, natural disasters, or issues caused by roofing, fascia board, or rafter tails. Are your installer’s subcontractors or full-time employees of your company? Our installer is the owner of our company. Oscar is very knowledgeable and loves what he does. Believe it or not, gutters are a passion for him and he foresees himself doing this for the rest of his career. Most jobs take one day to complete, but it really depends on the size of the home. What about clean-up of the job site after the gutters are installed? We clean up the area before leaving our job sites to make sure they are as clean as when came to install the system. What type of buildings can you install gutters on?